Writing about the food of Paris is almost as overwhelming as writing about my wedding day or the birth of a child — so filled with wonder, joy, sublime layers and feelings, but I can barely manage to choke out more than tired cliches when attempting to describe it, and those tired cliches will never do it justice. What shall I include? What shall I omit? Anything I write will be woefully inadequate, but I feel compelled to try. How was the food and dining experience in Paris? Spectacular. Wondrous. Magical. Artistic. Satisfying. Fresh. Delicious. Loving. I am so happy that my fancy, dress-wearing events occurred at the beginning of my time in Paris and not at the end, because I’m pretty sure none of my dresses would have zipped up by days 5 through 10. Needless to say, we ate well. Very, very well. I am intrigued, almost to the point of obsession, about how a country can remain so slim and chic, yet eat like they do. After careful study, I have concluded a few things. One, like many city dwellers throughout the world, they walk a lot. Lydia estimated that she walks about five kilometers a day (about three miles), and I believe it. They are not a sedentary people and yet most do not seem overly occupied with le sport and working out, as we do. Two, they are not snackers. French people savor every meal, eating slowly, always putting down their forks between bites. Meals are never rushed. That was one of my favorite things about my time there — the ability to feel like I can sit, relax, eat, and converse through multiple courses. The fact that much of the country is still eating multi-course dinners at 9:00 pm does not seem to hurt their waistlines, so our old American maxim of “no eating after 7:00 pm” is heartily disproved in France. And finally? Portion, portion, portion control. I loved eating an appetizer, main course, salad, dessert or cheese, followed by coffee or armagnac, and never once feeling like Miss Piggy because it really was a little bit of everything and most places did not serve giant American portions. I was satisfied without feeling like a glutton. Considering how well I ate, I really didn’t gain that much weight — about two and a half pounds. I am quite sure most Parisians would struggle maintaining their weight if they ate twenty-seven restaurant meals in row, too. I have a feeling if I ate as many American restaurant meals for ten days straight, that number on the scale would be much higher. In any event, only an idiot would go to Paris and attempt to keep any sort of diet. The food is as much a part of the landscape as the museums and monuments, and missing out on that would be missing out on Paris itself. I love escargot so much that it hurts. 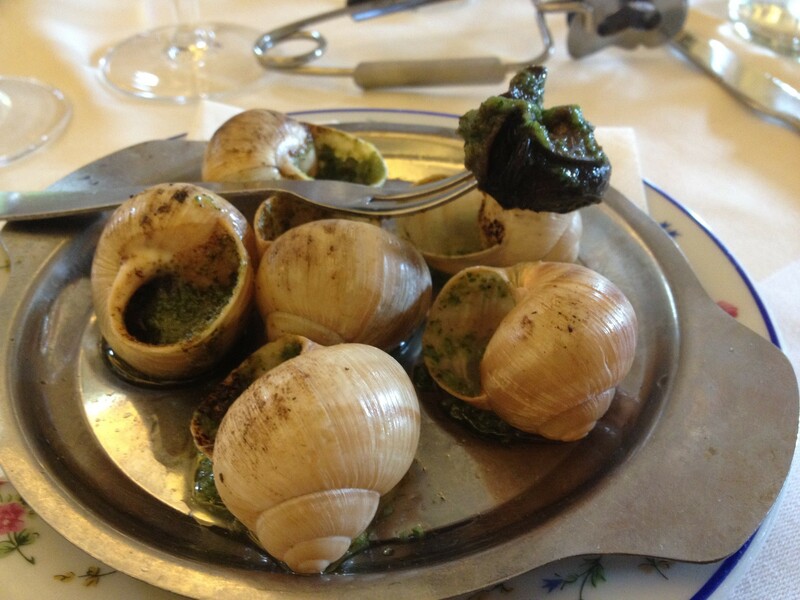 It is truly one of my perfect foods, and having escargot in Paris was one of the greatest experiences of my culinary life. I think I ordered escargot four times during the course of my visit, and they were spectacular every time. The picture above is from a lovely restaurant in Le Marais called Carrette. Most of the time, they were served as pictured above, but I did order them once in puffed pastry, too. The simple preparation using garlic, wine, butter and herbs is my favorite. Croissants are a big part of daily life in France, and even though I am not a big bread-in-the-morning fan, skipping croissants seemed like skipping the Eiffel Tower. This picture of my daily French breakfast was taken from my neighborhood cafe, a spot which was cordial but not especially friendly. However, the price was right — under 4 euros for a coffee and croissant, while my hotel charged three times that amount for the same plus cereal and fruit. 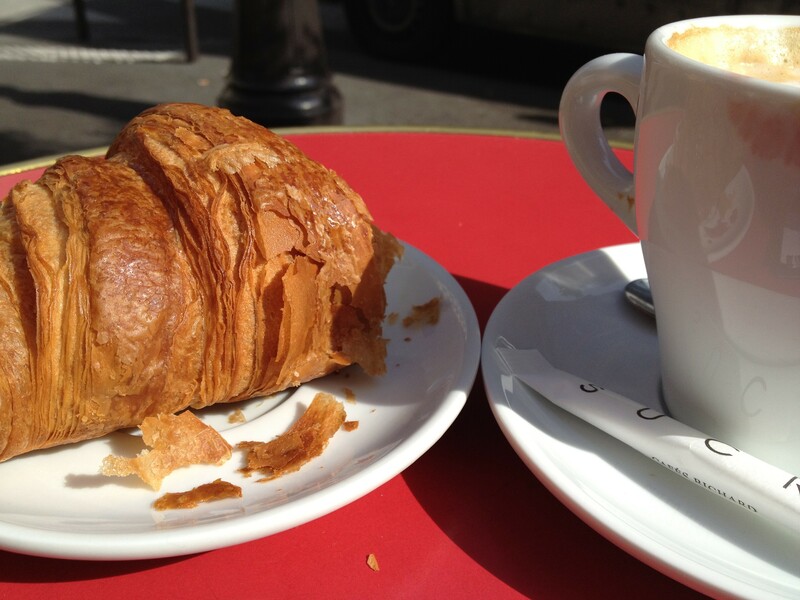 It was a nice start to my morning, sitting outside with my leisurely croissant and coffee while planning my day. I will miss my daily croissant, but my jeans will stop fitting if I continue this tradition. 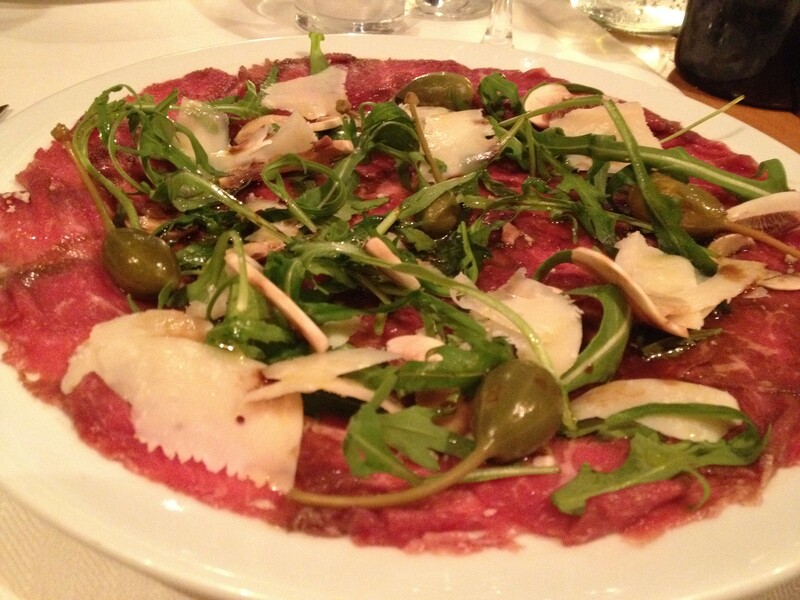 Salads are a popular choice for lunchtime, and I ordered a slightly different version of this carpaccio salad at least three times that I can recall. It was incredibly flavorful and satisfying without ever feeling heavy. I am going to attempt to make something like this at home very soon. 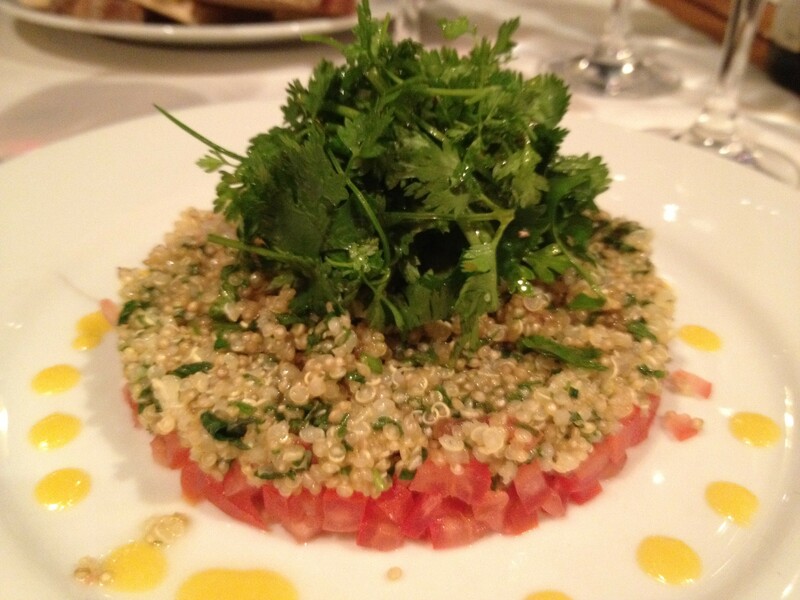 If I ate escargot every chance I got, Ed ate some version or another of salmon tartare: he had salmon tartare topped with avocado, he had salmon tartare topped with cream, he had salmon tartare topped with crab, and, shown above, he had salmon tartar topped with quinoa and herbs. Each version was delicious, but this one was probably my favorite. Finally, no food post about Paris is complete without mentioning macarons, the petite French almond cookies filled with ganache. Macarons may have been around since the de’ Medicis, but they just came on to my radar recently. (Also, I recently discovered a hot new band from England called The Beatles, have you heard of them?) 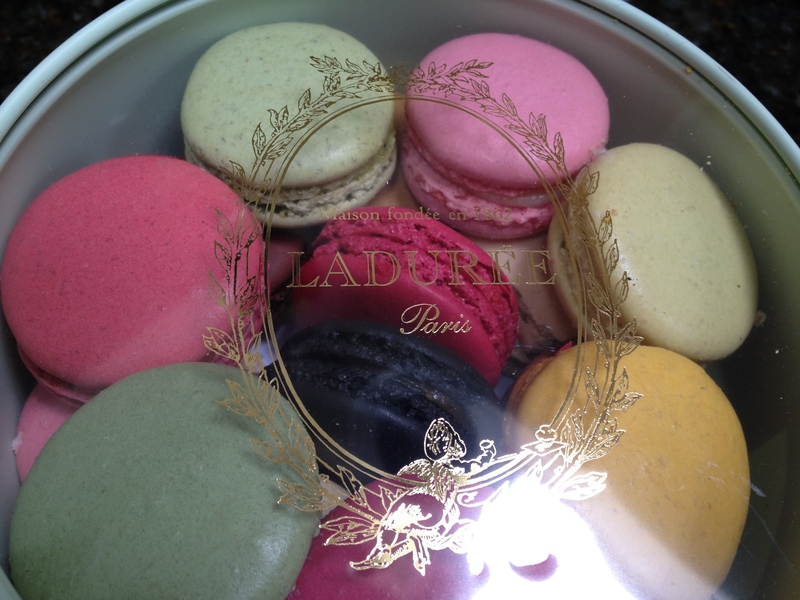 The two great places to purchase macarons in Paris are Laduree (pictured above) or Pierre Hermé, which was conveniently located around the corner of our hotel. I am still trying to process how I feel about macarons. For one, they are pricey — about $1.60 a piece, which is certainly one way to help exercise self control while eating cookies. This tiny box, which any of my children could single-handedly consume in one sitting, was about $28. Like many other delusional American home cooks, I think I will attempt to make them myself one of these days. Julia Child has taught me to be fearless in the kitchen. I have so much more to share — I could easily go on (and on and on and on) for weeks more, but I do believe it is finally time to stop and focus on the present. I will leave you with one of my favorite pictures taken from a market in Le Marais, and it sums up Paris perfectly: the ordinary is beautiful, and there is beauty everywhere you turn. Everywhere. I am so incredibly fortunate to have had this experience, and I know it will always be with me in a thousand different ways. I have changed for the better. This entry was posted in Life and tagged Carette, carpaccio, croissants, escargot, Le Marais, macarons, Paris food, Paris travel, salmon tartare, travel by Mom Mom's Apron. Bookmark the permalink. 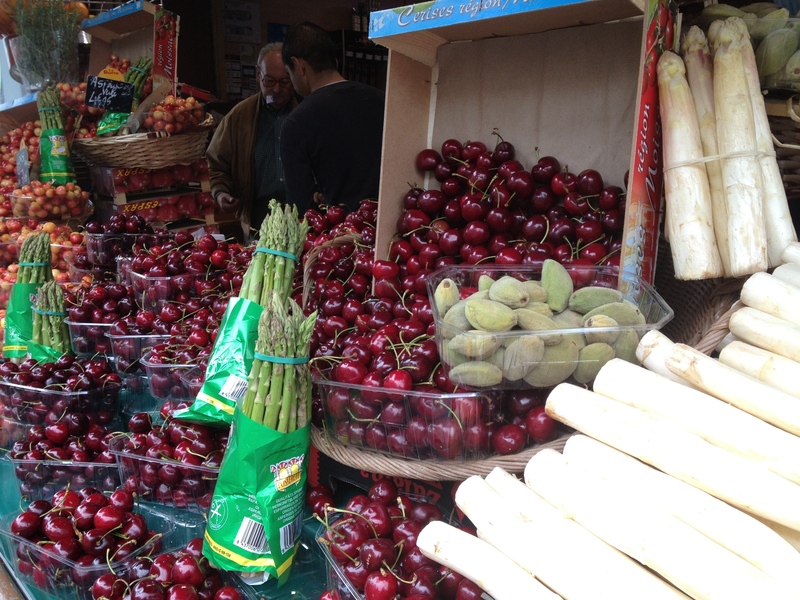 I love shopping for food at French markets, everything is just so dam irresistable! Those cherries look delicious! Beautifully written!! I know that you a great time in Paris. That makes me happy. Wow, this was wonderful to read and was spoken by a true foodie! The last picture did capture the flair that the Parisians have in so many things. Small portions is really something that Americans need to copy. I’ve really enjoyed following your journey through Paris! The food looks amazing.